Collecting employee feedback via TINYpulse is an amazing first step towards a more open and transparent culture. However, if you aren't taking action to address the feedback, it's almost worse than not asking for it in the first place. Some things administrators can do in TINYpulse to be transparent and close the feedback loop are sending private messages on responses and suggestions, creating shareable reports after every survey, turning on LIVEpulse to let employees collaborate on suggestions, and using the Wins Board. The Wins Board is an organizational tool used to track progress on employee feedback. Create initiatives to take action towards a better workplace, and celebrate with a Win once a solution has been reached. This board is the easiest way to improve transparency with employees, keep them in the loop, and save you time as an administrator by giving employees visibility into the amazing work being done to address their feedback. (i) You must have Admin or Super Admin permissions in Engage in order to enable and use this feature. All roles can view the Wins Board in LIVEpulse. Feedback comes in through many channels like anonymous employee suggestions in TINYpulse, 1:1 conversations, all hands meetings, and more. Employees already have the tools they need to give the feedback, but how are they tracking progress on it? That's where the Wins Board comes in. This card-style tool is mutually beneficial as employees can use it to track progress on their feedback, and administrators can use it to stay organized. Under Consideration: This column is your unprioritized to-do list. All anonymous TINYpulse suggestions given in the last 3 months appear here automatically and you can even create your own backlog items if you have a piece of feedback that came from your pulse responses or even outside of TINYpulse. In Progress: Move items into the In Progress column when you're ready to work. Here you can add collaborators to delegate responsibilities to others and even add tasks to show step by step progress. Wins: When you're done, celebrate by moving a card to a Win! Employees can track progress all throughout the process and view your comments so you can close the feedback loop directly within TINYpulse. The full Wins Board is available when the LIVEpulse feed is turned on. If you don't have the LIVEpulse feed enabled for employees to view suggestions in the employee portal, then you'll get a modified version of the Wins Board where suggestions are not automatically populated. But this might be a good opportunity to reevaluate the benefits of LIVEpulse like improved organizational transparency, higher employee usage of TINYpulse, and more. To turn on the LIVEpulse feed for the full Wins Board, visit Users and Settings -> Settings -> LIVEpulse Settings and either enable the main toggle or select the first option in the list. This will turn on the suggestions / Wins feed in the employee portal as well as the Wins Board for both admins and employees. As an administrator, you can either use the Wins Board to drag and drop suggestions cards from one status to another or create your own work items. The first column of the Wins Board is your backlog. All suggestions will land here by default for your consideration and prioritization if you have the LIVEpulse feed enabled. In addition to suggestions, you can add your own items to this to do list as well. Just click the Add New button at the top of the Under Consideration column, and enter the title and description of the work item. Move a card from the Under Consideration column to In Progress. Create a new item directly in the In Progress space. Set the status of an Engage survey response or suggestion to In Progress right on the Engage dashboard. 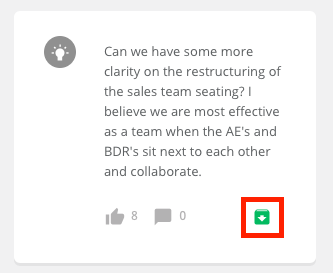 Moving an item into In Progress allows you additional options to add collaborators, tasks, and even notify employees. Add collaborators: Collaborators are great because they can be any TINYpulse user in any role; they do not need to have admin permissions. These are the folks you want to be responsible for addressing this feedback and completing the initiative, allowing everyone in the organization to participate in finding solutions to improve your company's culture and workplace. Create tasks: Tasks outline your game plan for reaching a solution. Both admins and collaborators can add tasks to outline the steps that will be taken, and everyone can monitor task progression from the Wins Board and in the LIVEpulse feed. For even better accountability, assign tasks to collaborators by entering @name directly in the task description. The assignee then receives both an email and an in-app notification letting them know they have a new item to address. Send a notification: Employees can visit the Wins Board or the LIVEpulse feed anytime to see new initiatives in progress, but the best way to keep everyone in the loop is to send a notification. When creating the work item, you can choose one, many, or all segments to notify, and those employees then receive both an email and an in-app notification to alert them of the new in progress item. The fun part comes once an in progress item is complete, and you can move it to a Win. These items stay on the Wins Board in the Wins section for 30 days. Employees can view the full Wall of Wins at anytime by clicking Wall of Wins on the left side navigation in LIVEpulse. All Wins are posted to the LIVEpulse feed for employees to celebrate. They can "like" them and add their comments to thank admins and collaborators for enacting positive change. Sometimes you might get duplicate suggestions, work items, or certain ones may not be feasible to resolve. Just click the archive button on a card from the In Consideration or In Progress columns to remove it from the Wins Board. If you archived a suggestion cars, it will stay on the LIVEpulse suggestions feed for further voting and commenting, but it will not appear anywhere on the Wins Board any longer. Remember that it's critical to close the feedback loop, even on suggestions that won't be implemented, so take a quick second to write a comment on the suggestion or send a private message so the submitter knows why it isn't being addressed.